In the month since our previous Syria report, the Free Syrian Army (FSA), Syria's main rebel group, has officially abandoned its failed ceasefire with government forces. This nominal change of stance has been presented as a response to continued massacres of Syrian civilians, for which government-supported militias are apparently to blame. 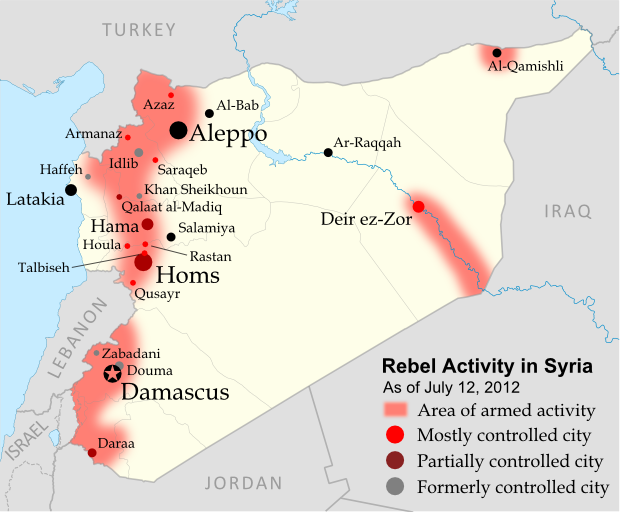 Though even the FSA is only a loose organization of rebel cells, other groups have also joined the growing conflict, which the U.N. has begun calling a "civil war". In the northwest of the country, rebels continue to control much of rural Idlib province, recently capturing the town of Armanaz, and apparently retaking the larger town of Saraqeb (Saraqib). The historical fortress of Qalaat al-Madiq is currently occupied by government forces, but the adjacent town is rebel-controlled. Furthermore, the long plain extending north from Qalaat al-Madiq nearly to the Turkish border is now reportedly administered by the rebels as something of a parallel state. Areas of the frontier itself have also become a rebel safe haven from air attacks, a result of Turkey's transfer of weaponry to the border to defend its air space. Meanwhile, for the first time major rebel activity has spread further westward to Latakia province, where a month ago the insurgents briefly captured the town of Haffeh (Haffah) before withdrawing again. Another defeat came in Khan Sheikhoun, a large town in Idlib province along the government-held Hama-Aleppo road. The central province of Homs has also continued to see heavy fighting, with the FSA capturing the town of Talbiseh and claiming to control all of Qusayr (Quseir), which for months was divided between rebel and Syrian government held areas. In Syria's capital region, the government has again driven rebels out of the Damascus suburb of Douma. On the other hand, recent reports indicate that opposition forces now control most of Deir ez-Zor (Deir Ezzor), a major city in the country's far east. Finally, in an echo of events in Libya last year, opposition protesters in Syria have been flying an older version of the country's flag, from before President Bashar al-Assad's Baath party came to power. Based on what happened in Libya, it seems likely this flag could come to serve as the banner of a competing rebel state if the Syrian civil war continues to escalate. Further Reading: Holliday, Joseph. Syria's Maturing Insurgency (PDF). Institute for the Study of War (June 2012). Graphic of current Syrian flag is in the public domain (source).